Share in Cleopatra’s riches in Queen of Gold set in ancient Egypt. Discover the ancient Gods and rulers of Egypt as you play the game. Keep an eye out for an additional reel on the screen, which can bring you some extra riches… on Wizard. Pragmatic Play is a relative newcomer to the world of online slot gaming but they have certainly established a name for themselves and a trusted one at that. Their focus is on games that engage and excite. With over 80 slot games to their name, they are a company with innovation and dedication always at the forefront of what they do. Their team consists of creative thinkers, they do extensive research and take time with their development of the games they produce. 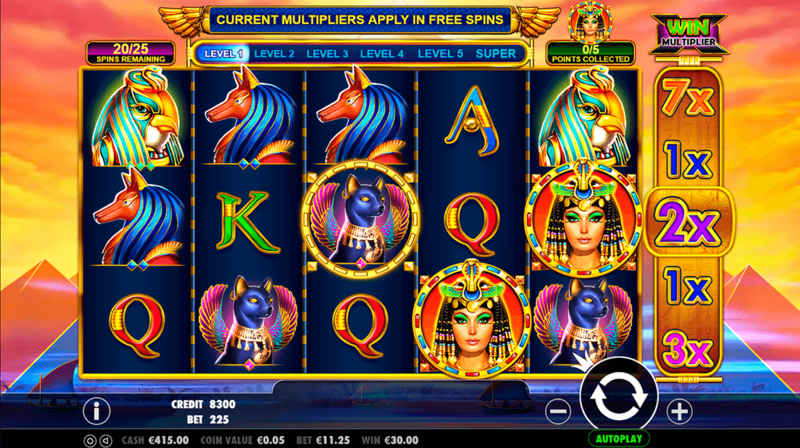 Some of their games include Wolf Gold, Panther Queen and Hot Safari, view our UK slot games today. The Ancient Egyptians were known for the decadent designs and architecture and their worship of many gods. Queen of Gold effortlessly takes you back to a time of religion and riches during the reign of Cleopatra. 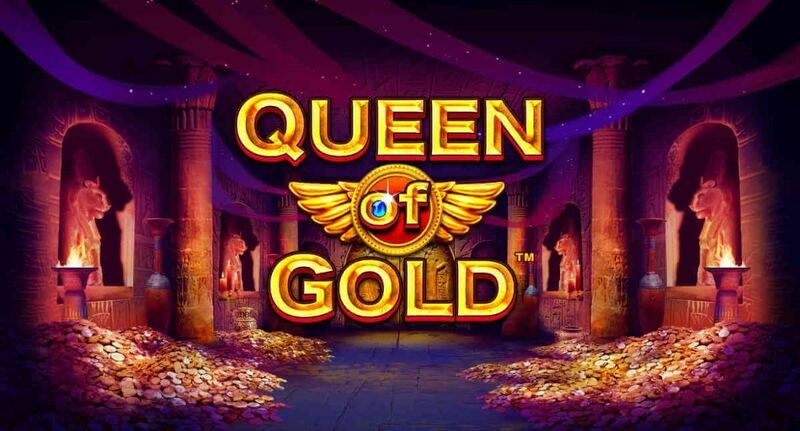 Queen of Gold is a is a 5 line, 25 pay-reel games. Place bets from £0.01 and £0.50. This is a decadent, exotic game with stunning graphics. The music is exotic and ancient and sends chills up the spine. We recommend players to read more from our guide for the better selection of the best UK online slots for them. Score between 200 and 400 coins when you land 5x of the lower paying symbols which include the letters of the deck of cards such as J, K and A. The higher paying icons award up to 2000 coins and these are the animals that are Egyptian Gods, such as the dog who is Anubis and the cat goddess Bastet. The game is structured over 6 levels, meaning there is a sense of progression as you play. · WILD – this is an ancient Pharaoh and will substitute for any symbol in the game. · SCATTER – this is a glinting blue pyramid. 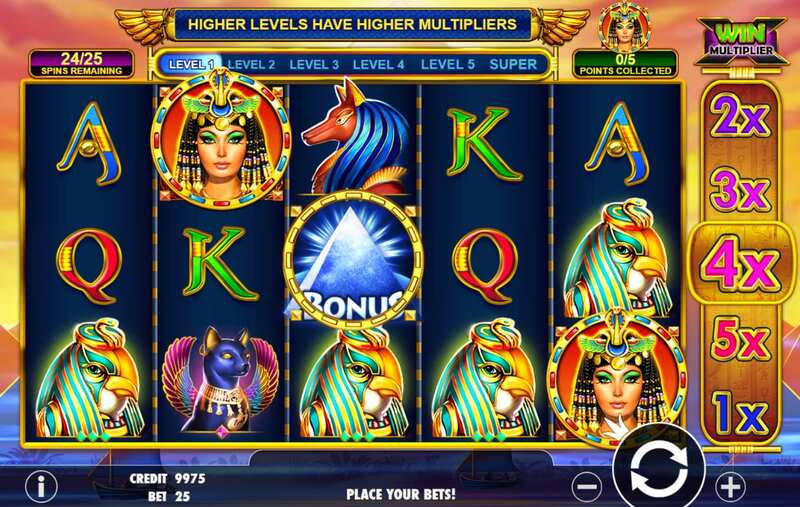 3 of these pyramids on lines 1, 3 and 5 will activate the free spins feature. · FREE SPINS - this feature will allow for 10 free spins and there is no limit to the number of times this can be triggered. · SIXTH REEL – this is a less common feature in slot games and adds a little extra to Queen of Gold. It is a great chance to win some extra cash as each time you spin the main 5 reels, it will also spin and potentially increase your winnings from the main game. This feature is also how you move between the levels. Whilst the wins here aren’t the biggest, you can win up to 200 x your bet.